Top Gear marks 50 years of James Bond films with a rip-snorting celebration of 007âs most iconic cars. From the gorgeous, gadget-laden Aston Martin DB5 and aquatic Lotus Esprit to the gawky Citroen 2CV and spiral jumping AMC Hornet, Richard Hammond looks at the machines that moved the worldâs favourite spy and gets the stories behind them from Bond legends including actors Daniel Craig and Sir Roger Moore, directors Guy Hamilton and Vic Armstrong, and producer Michael G. Wilson. Inspired by the on-screen Q Branch, Hammond also attempts a car gadget of his own with a home-made âinvisibility cloakâ and takes a plucky, low budget stab at something even the Bond producers couldnât crack - building a fully working Lotus submarine. 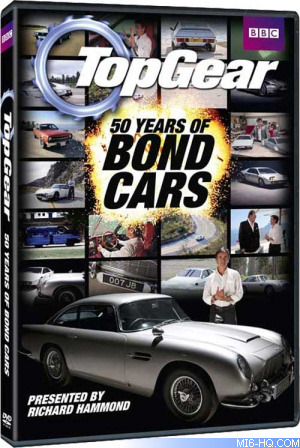 Top Gear â 50 years Of Bond Cars. Itâs almost as exciting as an actual Bond film. The DVD will be released in the USA a few days earlier than the previously announced UK edition: February 12th 2013. Thanks to `MeladMoshiri` for the alert.